1. Line a flat baking sheet with greaseproof paper. Drop 6 individual tablespoons of the chocolate spread, spaced well apart onto the paper. 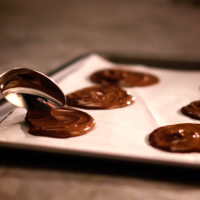 Using the back of a spoon, smooth the chocolate spread into 7cm circles. Freeze for 30 minutes or until firm. 2. Sift the flour, sugar, baking powder and salt into a large bowl and make a well in the centre. Whisk together the eggs, buttermilk, melted butter and vanilla extract in a large jug then pour into the well. Whisk together until smooth. 3. To cook the pancakes, heat a little oil in a large non-stick frying pan over a medium heat. Spoon a small ladleful of the batter into the pan and spread to about 8cm, leave for 30 seconds then press a chocolate disc into the middle. Immediately top the chocolate disc with another small ladleful of the batter, making sure the chocolate is totally covered, and cook for a further minute until small bubbles begin to burst on the surface. 4. Carefully flip the pancake, cook for a further minute or until batter is cooked through, then transfer to a warm plate. Repeat with the remaining batter and serve warm.